If you’re experienced with pontoon boats then you already know about Bentley boats and Bentley pontoon boat accessories. However, if you’re just stepping into the realm of pontooning, you might ask yourself the following question: are Bentley pontoon boats good? The answer is yes, depending on what you’re looking for. Bentley pontoons aren’t known for their flashiness. With most of Bentley’s models you won’t get a boat that’s an immediate head turner. What they lack in ultra-luxury, they make up for in comfort and durability. When you buy a Bentley pontoon, you’re paying for something that’s functional and reliable. For this reason, many experienced boaters agree that Bentley pontoon boats are great starter boats. The 243 Cruise is Bentley’s answer to the large-sized cruisers that make popular party boats. With a sticker price of roughly $40,000, the 243 Cruise is one of Bentley’s high-end models. The benefit of owning the 243 Cruise is that you get a dependable boat with a spacious and comfortable interior. This means that you and 15 of your closest companions can enjoy an entire day on the water without feeling crammed together. Also, the 9’ Bimini top is easy to set up and is perfect for those who want to cool off away from the sun’s rays. The 25” diameter tubes on this Bentley tritoon are covered by a lifetime warranty. The tan interior color scheme that comes with the SE version makes for one nice looking boat. The Bluetooth and MP3-compatible Jensen stereo plays crystal clear music. Its 250hp motor is great for waterskiing, tubing, and wakeboarding. The helm's design looks plain and boring. The pop-up privacy room is only 5'7" tall. Despite the high price tag, the 243 Cruise doesn't come standard with a ski/tow bar. It doesn't have any steering improvements, not even tilt-steering. Overall, the Bentley 243 Cruise is a well-rounded boat that’s built with excellent craftsmanship and provides a great level of comfort. If you want a pontoon boat that’s large enough to stretch your legs, even when you have a full number of passengers, then this boat is a good option. However, the boat does feel like it’s lacking in other areas. While the 243 Cruise provides size, power, and comfort, there’s little luxury to this boat. 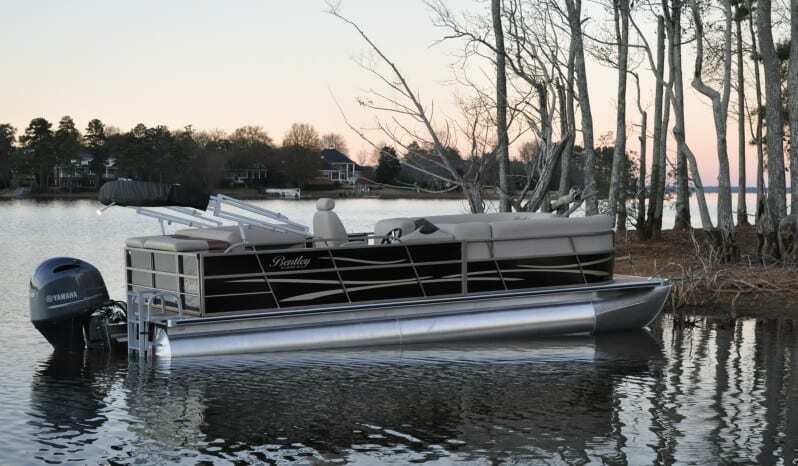 The Encore 200 is a basic 20 ft Bentley pontoon that’s designed for cruising on the lake. Equipped with a Mercury 90hp engine, the Encore 200 isn’t the best pontoon around for watersports. However, it’s perfect for fishing and small get-togethers with seven or eight of your closest friends. One of the key reasons that the Encore 200 is an attractive boat is that you’re able to buy a reliable pontoon for less than $25,000. As long as you’re not looking for high-class amenities and fancy gadgets, like fish finders and GPS navigation, then this Encore 200 is a great budget pontoon. One of the nicer features of this boat is the two L-shaped lounges. The cushion material is soft and comfortable, which makes the seats feel more like pillows than actual cushions. It’s a great mid-range boat that’s comfortable and functional. The extra-large captain’s chair is suitable for all body types. The two L-shaped lounges are great for a couple people to stretch out on, and they can comfortably sit six people. There’s a lot of under-seat storage space in both lounge sections. The deck is covered with a lifetime warranty that transfers with ownership of the boat. The engine is relatively weak. Don’t expect a lot of power for wakeboarding or waterskiing if you have eight passengers on board. The boat has a very basic look to it. There’s nothing special in terms of appearance. The captain’s chair looks too much like a car seat. The Encore 200 Cruise is a solid pontoon boat that can provide hours of fun on the water. If you’re looking for a pontoon that’s stylish and full of nice amenities, then this model is not for you. The biggest problem with the Encore 200 is that it seems a bit too basic for a suggested retail price of $25,000. The Encore 200’s redeeming quality is durability. Despite being a bit mediocre in the looks and performance departments, this boat will withstand years of usage without any problems. Furthermore, since most of the boat’s structural components are covered by warranty, you won’t have any problems repairing any damage the Encore 200 takes. The 243 Fish N Cruise is one of Bentley’s top fishing model pontoon boats. This 24’ long pontoon boat is able to accommodate 14 people comfortably. The boat has two lounge areas with a total of four couches, plus a captain’s chair and two additional seats. Since this pontoon has ample floor space, a boat filled to capacity won’t feel at all cramped. One thing that I like about the 243 Fish N Cruise is that it looks nice. The plywood deck, furniture, and power-coated railing all give the boat a stylish. This alone sets the 243 Fish N Cruise apart from other mid-range Bentley models. I also like that you get the option of adding a third pontoon, which is great if you’re willing to pay a little extra money for a smoother ride. It’s comfortable and spacious, which makes long fishing trips a pleasure. The wheelchair accessible gate at the front of the boat makes it easy for anyone to board your pontoon. Anglers will love the two fishing seats. The 243 Fish N Cruise comes with a livewell built in, and you get the option for an additional one. Most of the boat’s exterior is covered by a lifetime warranty. The 243 Fish N Cruise is really basic. If you’re looking for a lot of amenities to make your cruising and fishing time more comfortable, this is not the boat for you. The lack of built-in rod holders and a fishing station is disappointing. There’s nothing special about the captain’s chair; it looks more like an office chair than a helm chair. The instrument panel looks cheaply made, which takes away from the otherwise impressive look of the boat. There’s no option for a GPS or fish finder with this boat. Overall, the 243 Fish N Cruise is a functional boat that is perfect for cruising the waterways. However, when it comes to fishing boats, the 243 really misses the mark. There isn’t much about the boat that’s even related to fishing aside from its livewell. Additionally, there isn’t even an empty space in the helm where you can install a fish finder easily. While the 243 Fish N Cruise is not the best pontoon for serious anglers out there, it will make a decent family boat. When it comes to Bentley pontoon boat ratings, the 220 Elite Admiral is easily one of Bentley’s top models. It’s comfortable, spacious, and has a really stylish look to it. Bentley released the Elite range of pontoons in hopes of gaining traction in the luxury pontoon market. With the release of the 220 Elite Admiral, Bentley was able to show that they’re capable of making top-of-the-line pontoons that come at a midrange price. It comes standard with a nice 115hp engine that gets the job done. The tubes, transom, and plywood deck are all covered by a lifetime warranty. Its carpet is protected under a three-year warranty. The glovebox is a great addition for keeping valuables protected from water. The brown and tan color interior looks really nice and adds to the boat’s luxurious image. Bentley did a great job upgrading the helm chair and making it look more appropriate for a captain. Despite being Bentley’s top-range model, the 220 Elite Admiral still seems a bit basic. Double Bimini, tilt and hydraulic steering, and ski towing are all options. It has no option for GPS or fish finder. The 220 Elite Admiral looks nice, has a bit of power to it, and feels great to sit in. However, like other Bentley models, it just doesn’t offer any special amenities that make it truly luxurious. Do you want a reliable pontoon that isn’t going to cost a small fortune? If so, Bentley models are perfect. Since Bentley typically builds all of the furniture for their boats, they’re able to sell pontoons for a cheaper price. Don’t expect a lot of specific Bentley pontoon problems with your boat. As you may have noticed from these Bentley pontoon reviews, their pontoons are popular because of their excellent craftsmanship and durability, and most of the parts are also protected under warranty. The only issue with Bentley products is that all their boats are more functional than flashy.